KOKOMO, Ind. – There have been many firsts since Kokomo Municipal Stadium opened its gates four year ago, but until April 30, it had not included high school softball. That changed when Kokomo and Western brought its annual Cancer Awareness Game to the downtown venue, and in front of nearly 1,000 fans, the two squads put on an instant classic. 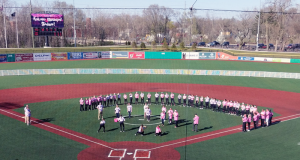 The night opened with a ceremonial first pitch, thrown out by four women affected by cancer – survivors Juanita Tebbe, Sherri Parish and Janis Cooper along with Kokomo educator Megan McConnell, who is currently battling the disease. Once players and fans cleared away tears from the emotional ceremony, the game was on and Western struck first courtesy of a Chase Epp solo home run. Down 1-0, Kokomo took a 4-1 lead in the top of the third. Olivia Branch singled, Baleigh Keesling-Mayer walked, Ellie Trine ripped an RBI single and Lauryn Hicks knocked home two with a double. Savanah Emmons closed the scoring with an RBI single. Western earned a run back in the bottom of the fourth on a Kinsey Smith solo home run, only to see the Lady Kats tack one on in the top of the fifth – Hicks singled and scored on an error. Down 5-2, Western stormed back in the bottom of the fifth as Karlyne Shepherd and Tori Turner had back-to-back singles to start the inning. Chase Epp was hit with a pitch to load the bases and clean-up hitter Emma Key showed why she was in the power batting position by launching a grand slam to give the Panthers a 6-5 lead. That lead held until the top of the seventh, but Kokomo was not done. Keelsing-Mayer walked and pinch-runner Tionna Brown stole second base. Hicks was then intentionally walked with two outs. Number three hitter Taylor Simmons sent a pitch to the base of the temporary outfield fence for a two-run double and Savannah Emmons followed with an RBI single to give the Lady Kats an 8-6 lead. With starting pitcher Hicks still on the mound for Kokomo in the bottom of the seventh, Key led off with a single and the game appeared to be tied when Smith sent a ball to dead center field only to be caught by Branch near the fence. After a Sadie Harding single to put the tying run on base, Hicks retired the final two hitters to preserve the win. Hicks pitched all seven innings to earn the nine-hit, eight-strikeout victory. She was also 2-for-3 at the plate with a single and double, two RBIs and three runs scored. Western reliever Brooklyn Shelton absorbed the loss. The event raised more than $600 for the American Cancer Society. This entry was posted in IHSAA, Kokomo, softball, Western. Bookmark the permalink.